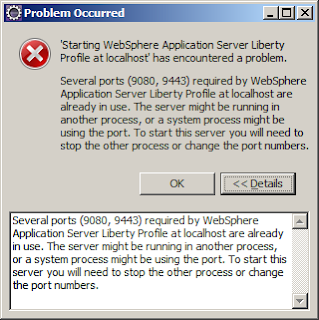 I face such issue as the Websphere Liberty Profile ports are used by a previous installation for the WMB so I have to manually kill the process in order to be able to start the application. 1- This is the error message that I got when I try to start the WLP server instance. 2- The bellow command lists the current ports and their processes ID's. netstat -a -n -o 4- Open the CMD.exe as Administrator. 3- Now that we knew the processes ID's we kill them by one of the two bellow commands. The argument /F forces the killing of the process.